Product prices and availability are accurate as of 2019-04-12 06:26:04 EDT and are subject to change. Any price and availability information displayed on http://www.amazon.com/ at the time of purchase will apply to the purchase of this product. 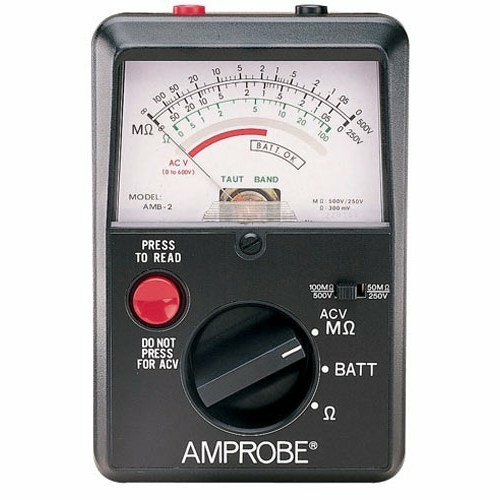 The Amprobe AMB-2 insulation resistance tester is an analog meter that measures insulation resistance to help reduce shock hazards and downtime on electrical systems that include wires, cables, transformers, and electrical motors. A manual range selection knob allows the operator to choose Megaohms or ohms measuring ranges. 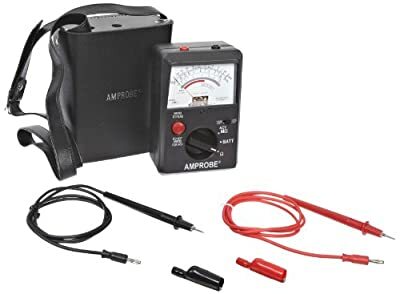 The unit measures voltage from 0 to 600V alternating current (AC) or direct current (DC) and insulation resistance from 0 to 100 megaohms using 300mV, 250V, or 500V DC test voltage. The low resistance range, which uses a 300mV test voltage, is designed to test the resistance of motor windings. The tester automatically discharges capacitance after use so that the test leads may safely be removed from the device. Test leads and a carrying case are included. The tester is powered by eight AA batteries (included). The AMB-2 is designed for use by electricians and electrical contractors. 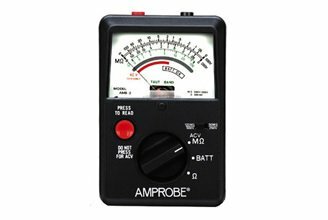 Electrical test meters report electrical circuit properties, such as voltage, resistance, capacitance, and continuity. Available in handheld or benchtop form, they detect electrical problems in equipment, wiring, and power supplies. A variety of probes, clamps, and leads can be used to connect the meter to a circuit or device. Single-function meters, such as battery testers and voltage testers, measure one property of a circuit, and multimeters measure multiple properties. Electrical test meters display information either in analog form using a needle that moves on a calibrated scale, or in digital form using digits or a graphic representation on an LED screen. 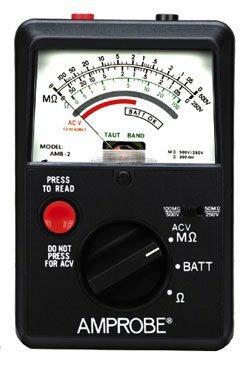 Meters have electrical properties that are to be measured and the anticipated range of results, and should have a rating that is higher than the maximum value of the anticipated range. 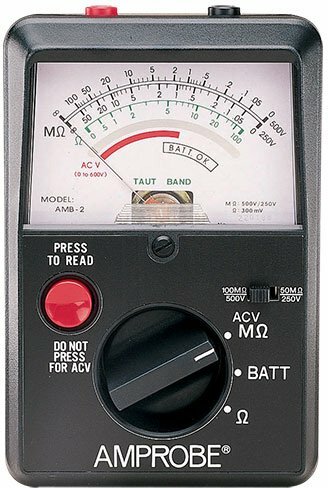 An electrical test meter has multiple settings corresponding to potential ranges of values for the properties it can measure. A manual ranging meter requires the operator to flip through different settings until the correct range is reached. An autoranging meter cycles through range settings automatically until it reaches the correct range.